Registration: Sorry, online public registration for this event has been closed. Call the Chamber at 616-531-5990. Invite your guests and not-yet-member business contacts. Tell them to bring lots of business cards and get ready for a delicious lunch and quality networking. Members ONLY: Showcase your business only $25.00! We've already started booking tables and space is limited so don't delay, reserve yours now! All Chamber Members are automatically entered in our Rolling Jackpot Drawing. How do you get in on this? Your business is already entered but you MUST be there to claim it if your company name is drawn. The Jackpot is at $25. We've got great food, huge networking opportunities and some really neat drawing prizes. You have to eat lunch anyway so plan to spend it with us and don't forget to bring lots of business cards. 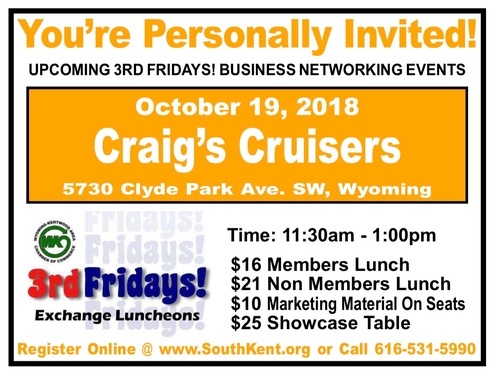 Log on at www.southkent.org for information and other great Chamber Events to help you expand your referral base.